I have come across an interesting problem in Microsoft Exchange Server 2010 (it is also typical for Exchange Server 2007 / 2013). 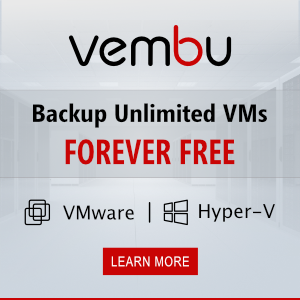 From time to time, some users started to complain on the inability to get scans from Multi-Function Devices (MFD) or senders configured to send emails through Client Access Exchange server (CAS). Meanwhile, Outlook users could send and get emails through the server without any troubles. The cause of the error is the end of free disk space on which the Exchange Hub Transport queues are located. The fact is that Exchange has a special component to monitor available resources — Back Pressure, which is also tracking free space on a disk, where the Exchange Transport Service queues are stored. Note. 90% and 99% are quite approximate, there is a formula to calculate it, in fact. In practice, it’s enough to keep to these values. So there should be at least 4 GB free on a 40 GB disk, where the Transport Service queue is stored. By default, the transport queue is stored on a system disk. After analyzing drive C:\, I have found that the folder containing IIS logs (C:\inetpub\logs\LogFiles\W3SVC1) occupy almost 15 GB of space. 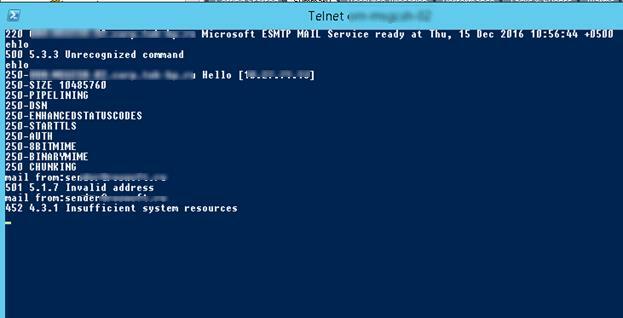 As a rule, these logs can just be deleted and enable the scenario of automatic removal of old IIS logs. If you are not able to free any space, move the folder of Exchange transport queue to another disk. 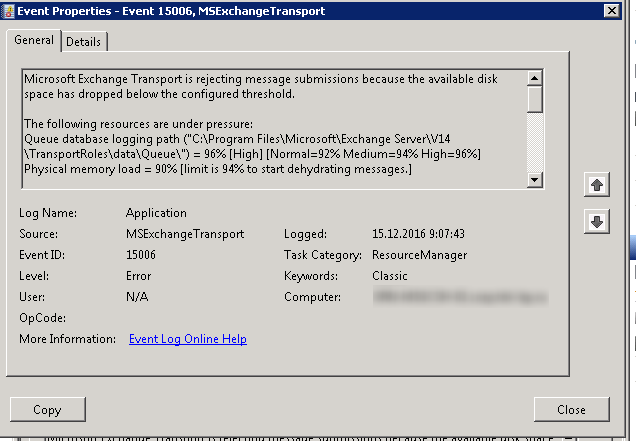 It’s enough to specify the new path to the folder of the queue and restart Microsoft Exchange Transport Service (Restart-Service MSExchangeTransport) and Exchange will automatically create them. Tip. Make sure there are Mail.que, Trn.chk, Trn.log, Temp.edb in the new folder. The same files from the old directory can be deleted because they are no longer needed.